“If you are fit, it is easier to master life,” Ms Quaas told The Sunday Times in an interview, which was translated into Enlgish through an interpreter. She works to give older people that message as she travels around the world for demonstrations and competitions, encouraging them to stay youthful through exercise and movement. She has been included in the International Gymnastics Hall of Fame, and was listed in the 2013 Guinness Book of Records as the world’s oldest gymnast. Ms Quaas was born in Saxony (then East Germany) and first fell in love with gymnastics at school, where she was often seen climbing up and down 5m bars with ease and rolling on the mats doing stunts. She took part in her first competition when she was 10. Unfortunately, her gymnastics had to be put on hold with the start of World War II, when all children and youth were enlisted to serve Germany in one way or another. Ms Quaas helped out with farming work, among other duties. Even after the war she could not return to gymnastics, since they had been banned in East Germany in favor of focusing more on team sports instead. Ms Quaas decided to play handball and was a member of the team that won the Eastern German Championship in 1954. Later on, she got married, had three children, and became a gymnastics instructor, until 1982 when, at the age of 57, she met two old friends (one 5 years older than her, the other 4 years younger, both of who have since died) who were fellow gymnasts and the three of them decided they wanted to try training and competing professionally again. Ms Quaas won a regional competition that year. Since then, she has 11 medals from the German Championships that take place every five years. Ms. Quaas continues to train almost every day for an hour, and enjoys hiking, swimming and dancing. The grandmother of two and great-grandmother of one also does not take any nutritional supplements; instead, she sleeps six hours a day and eats lots of fruit and vegetables. Not surprisingly, due to her German roots, her favorite pastime is whipping up dishes of pork knuckle and sauerkraut. “My face is old but my heart is young. Maybe the day I stop doing gymnastics is the day I die,” she says. 81-year-old, retired banker Masako Wakamiya just launched her first smartphone app. She noticed a lack of fun phone apps and games aimed at people her age. “We easily lose games when playing against young people, since our finger movements can’t match their speed,” Wakamiya said. 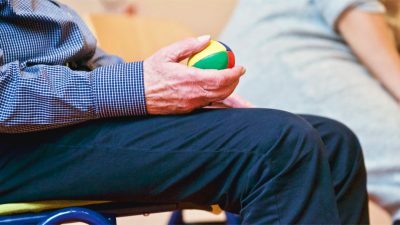 She asked many people to create games for seniors, but since no one was interested in taking her up on her idea, she decided to do it herself. 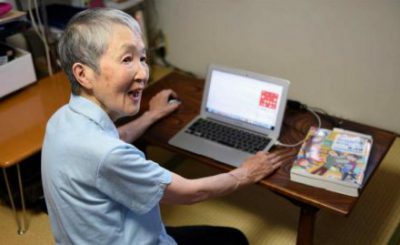 She only started using computers since she was 60; back then, it took her three months to set up her computer and get online, which speaks of the level of user-friendliness it lacked. It was around that time that she was caring for her elderly mother and found it difficult to maintain a social life. After setting up her computer, she joined what’s known as a “silver club” to learn how to use the internet and connect with others online. Her app, Hinadan, is an iOS game based on Japan’s traditional festival Hinamatsuri, or Doll’s Day, which is celebrated every March 3rd. During the festival, ornamental dolls representing the emperor and his entourage dressed in traditional clothing are displayed in a very particular arrangement; in Wakamiya’s app, users have to decorate the dolls, as well as position them correctly for the festival.